Recently, simple style in design has become very popular when creating websites. It looks minimalistic, clean, professional and easy to understand. Naturally, like any other style, minimalism wants to be thorough in everything. Fonts chosen for the site play a significant role in the overall composition and design. If you have chosen the fashionable way of simplicity. 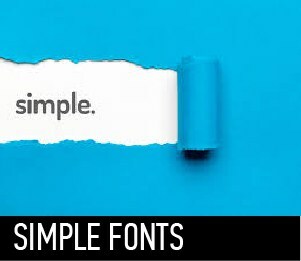 You will definitely need clear, minimalistic and simple fonts. There are several subtleties in working with such fonts, they will be useful to you. The first and most important is the essence. Minimalist fonts will not look good in visually rich designs. Better smaller, but better – they will look great in minimalist designs with an abundance of empty space and a small number of elements. If you use minimalist fonts, don’t forget about contrast. Try to use light fonts on a dark background or vice versa. Greater contrast makes your text more readable, although minimalist fonts tend to blend in with the background if there isn’t enough contrast. The strong contrast will also improve the overall look and make the fonts really stand out. A well-designed website with such fonts will look Great. The impression on visitors, in any case, it will produce only positive. When creating a good clean design, each of you can use simple, neat and discreet fonts. Our collection of fonts on a given topic will be to your taste. Enjoy!